Our great selection of unique handmade Christening and Baptism cards are the perfect way to convey your best wishes to the special day. 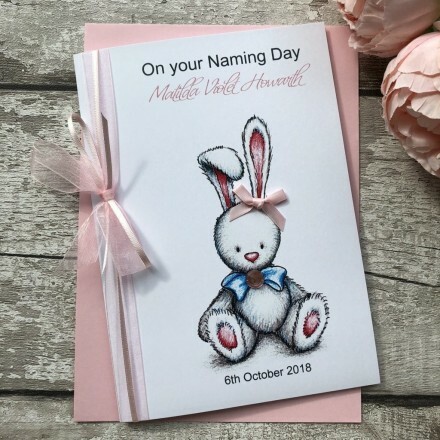 This pretty christening rabbit design is the ideal choice for any little one to convey your very best wishes. This card features an image of a rabbit styled with a large diamante with a satin ribbons and is finally finished with a double side tied ribbon . This combination makes this card a perfect choice for the special day. This handmade Christening – Baptism card is teamed with a matching square envelope, protected in a sealed cellophane bag and sent to you in a double board outer envelope to ensure it arrives in pristine condition.